Earlier this week I showed you my new hot beverages zone and shared tips to help you create a similar place in your kitchen, especially if you have a small kitchen. 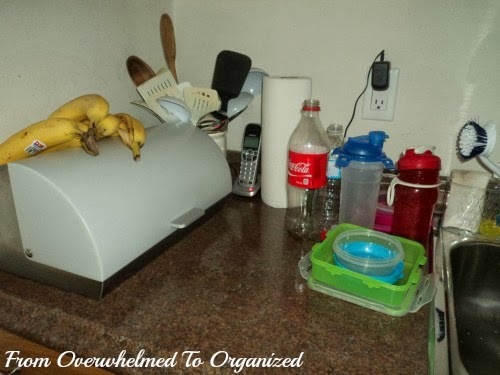 It's all part of my kitchen organizing tips series. Today, I want to share my new breakfast zone! Here's a list of all the tips I've shared already (with links to the corresponding post). OK, on to today's post! When I showed you my hot beverages zone, I mentioned how I often got dizzy from spinning around in my small kitchen reaching for things in different places. Well, it's kind of the same story for our breakfast supplies. I don't know why I had things in so many different places, but I think it's just that our needs have changed over time and we just got used to having everything where it was. But since I'm moving so many things around I took a look at our breakfast supplies and decided to make mornings a little simpler by having everything in one zone. So, I've created a breakfast zone on the counter on the left side of my sink and in part of the cupboard just above it. Before I show you the new zone though, here's a look at what this area looked like before. I've never liked how cluttered this counter was. I'm on a mission to get stuff off the counter that doesn't need to be on it. You'll see more of how I'm doing that in upcoming posts. Here's what the cupboard above this counter looked like before. It was kind of a jumbled mess of breakfast, lunch, and dinner food, as well as plastic bags and condiments. I moved the plastic bags into my "junk" drawer when I organized it, and you'll see where our condiments ended up in another post. I purged a few old items from this cupboard, and added in the food items from the cupboard beside it (so I could use that one for dishes only). Then I organized this cupboard better. 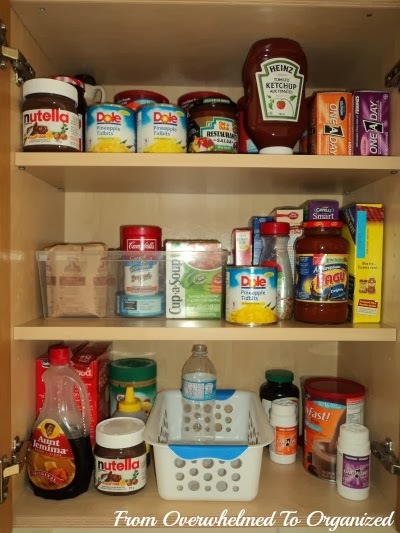 The first step was to group all the breakfast foods together instead of having them spread throughout the cupboard. Then I moved a few things off the counter below the cupboard so I could have everything in the same part of the kitchen too. Ready to see my new breakfast zone? Here's the counter part. So much better than that cluttered mess it was before! 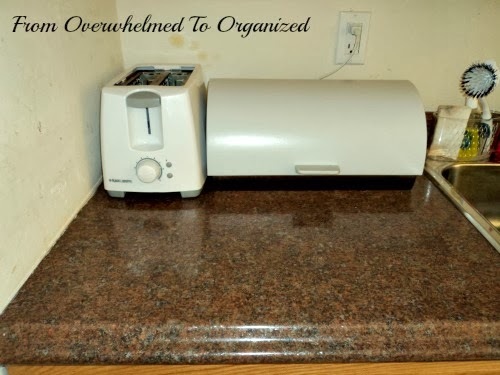 Like I said, you'll see where I moved the items that used to be here in a future post, but it's great to have the paper towels, kitchen utensils, and phone off this counter. Once I cleared the counter, I moved the toaster over to this side of the kitchen so it could be part of our breakfast zone. I also switched the breadbox to the back of the counter instead of the side. Now when we're making toast or heating up frozen waffles or making a sandwich, we've got space on the counter to do that! Back to my breakfast zone... Here's the cupboard above that counter after I organized it. The bottom shelf is now all breakfast or morning items. We've got everything we need for pancakes, waffles, or toast on the left. And our vitamins and my Slimfast are on the right. These bottles were always cluttering up the counter and toppling over like dominoes whenever they were accidentally touched. I needed a new system! The basket keeps them together and standing really well. I was just planning to find a place on the counters for it, but by better using the space in this cupboard I was able to fit it in here, which is even better because it's not taking up counter space or looking cluttered! It fits in with the rest of the breakfast stuff since he fills them every morning. 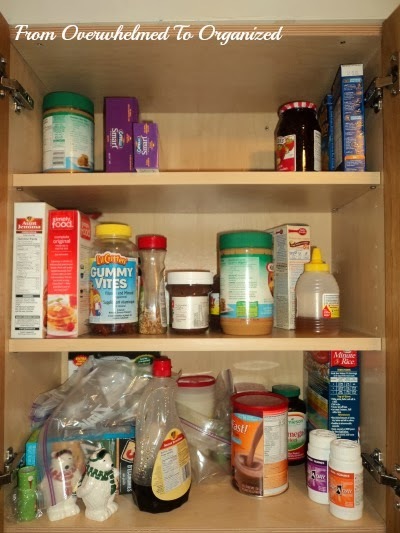 And since I have a small kitchen and I can't dedicate a whole cupboard to just breakfast foods, I'll just mention here how I organized the rest of the cupboard. Also on the middle shelf with that clear bin are some dinner foods. And on the top shelf are extra foods. 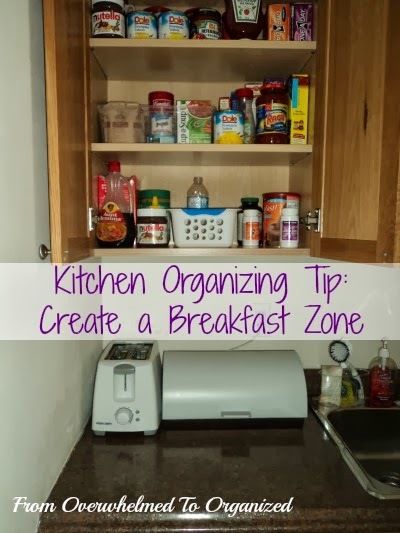 If you don't have a breakfast zone, use the tips and ideas from this post to create one. It will make your mornings easier! And stay tuned the next few weeks as I continue to show you my kitchen and share tips to help you organize yours. How do you organize your breakfast supplies? Do you have tips for creating a breakfast zone? What other tips can you share to make mornings easier? Ah, those water bottles that always need to be refilled !!! Still don't know what to do with them, they are exactly as you said, on the counter next to the sink, toppling over each other at any notice ! They don't topple as much in this basket as they did on the counter Gil. It's so much easier now! This was just a dollar store basket so it's a cheap and easy solution.